Orientation and mobility specialists help people with disabilities stay actively involved in society. They teach blind, visually impaired, and disabled individuals how to master the skills necessary to live independently and often encourage them to participate in various educa­tional or recreational programs. Specialists also serve as a source of information, referring clients to financial aid, benefits, and legal advice. These workers may be employed directly by an individual or indirectly through community planning, research, and publicity projects. Helping those with disabilities has long been a part of the social work profession. As early as 1657, facilities called almshouses provided shelter, food, and work to the poor and those with disabilities. In the mid-1800s, middle-class women referred to as “friendly visitors” visited the homes of poor families to instruct the disabled in house­hold management, the pursuit of employment, and the education of children. However, these friendly visitors and other early charitable organizations were sometimes limited in whom they would serve, often providing help and information only to those with their same moral views and religious backgrounds. People with severe disabilities were often confined to institutions. By the late 18th century, many states and counties had built these facilities, then referred to as insane asylums, for the 24-hour care of people suffering from afflictions ranging from mental retardation to paralysis. The patients of these hospitals were often committed against their will by relatives. Few efforts were made to help patients return to society to lead normal, active lives. The settlement houses of the late 19th century, such as Jane Addams’s Hull House of Chicago, led to the devel­opment of more sensitive and enlightened ways to help people. Social workers lived among the residents, listen­ing and learning along with them. But even with this new understanding of social work, those with disabili­ties were still unable to get complete assistance. Society wanted to help those in need but didn’t necessarily want to live among them. As a result, separate schools, work­places, and agencies for the disabled were established. Although social workers instructed blind people in how to cook and clean, how to use a guide dog, and how to read Braille, they made few efforts to integrate them into the community. Legal efforts to end this discrimination began in 1920 with the passing of the Vocational Rehabilitation Act. This act led to the development of state and federal agen­cies focused on enhancing the employment opportuni­ties for people with disabilities. Over the years, this act has broadened to include job counseling and retraining services and the provision of prosthetic and other assist­ing devices. More recent efforts toward ending discrimi­nation in employment and public services include the passing of the Americans with Disabilities Act of 1990. Although he was diagnosed with multiple sclerosis years ago, Ken Smith has only recently required the use of a wheelchair. He also has only partial use of his right hand. For the last few years, he has worked as a newspa­per journalist, driving himself to crime scenes, taking notes dur­ing interviews, and writing at a frantic pace to keep up with the pace of the newsroom. Now that he requires a wheelchair to get around, he is going to have to make many adjustments in his life. Fortunately for Smith, there are a number of services and ben­efits to help him; he just needs to know how to find this help. The simple act of providing information is one of the most important jobs of an orientation and mobility specialist. These workers help to direct people like Smith to the many agencies avail­able that assist those with vision and mobility impairments. By listening carefully to the prob­lem, orientation and mobility specialists determine the best route for assistance, contact the agency on behalf of the client, and make sure the client receives the proper assistance. Because of limited funding and support, dis­ability services are often unable to promote themselves. The biggest problem facing communities is not the lack of services available, but the lack of public awareness of these outlets. However, Smith will require much more than names and phone numbers from an orientation and mobility specialist. He not only needs to find the right wheelchair, but he also needs instruction on how to use it. His home needs to be analyzed to determine what modifications need to be made (for example, wheelchair ramps, hand­rails, and wider doorways). If the necessary modifica­tions cannot be made, he will have to consider moving to a new place. For all of these somewhat daunting deci­sions, Smith can ask an orientation and mobility special­ist for advice. Smith’s workplace may also require modifications. Though perfectly capable of continuing his work as a journalist, he is going to have to fulfill his duties in dif­ferent ways. For example, a special car may be required. Because of the limited use of his hand, he may need a modified computer keyboard or an assistant. An orienta­tion and mobility specialist can serve as a client’s advo­cate, negotiating with employers to prevent any cause for discrimination in the workplace. Specialists may also offer training and education programs to integrate or reintegrate the client into the workplace. An orientation and mobility specialist also serves as a counselor. A client may need individual therapy or a support group. The family of the client may also need counseling on how to adjust to a parent’s or child’s disability. In addition to offering services that directly benefit the client (counseling, advocacy, education, and refer­ral), some specialists may offer services that have indi­rect benefits for clients. These additional services include outreach, publicity, planning, and research. Because of a general lack of awareness of the social services available, orientation and mobility specialists may focus on ways to educate the public about the challenges facing those with disabilities. They may lead fund-raising efforts for research or programs aimed at assisting the disabled community. Because you will need a college degree and a well-rounded education, take your high school’s program of college preparatory classes. These classes should include math and science courses as well as a foreign language. Strong communication skills are needed for this work, so to improve your skills in this area take four years of English. Speech and journalism classes are also beneficial. Courses in history, social studies, sociology, and psychol­ogy are also recommended. Because a large part of the job is providing informa­tion about disability services, you should be comfortable using the Internet and various computer programs. Not only will you have to be able to work with computers yourself, you may be required to teach clients how to use them, too. The Association for Education and Rehabilitation of the Blind and Visually Impaired (commonly known as AER) provides a listing of approved orientation and mobil­ity programs at the graduate, undergraduate, and certification-only levels. 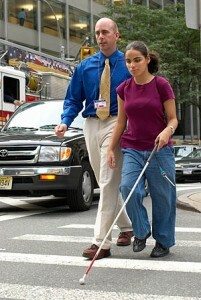 Programs include instruction in mobility techniques, where students simulate blindness or limited vision with blindfolds or other devices. Intern­ships with disability agencies are also incorporated into the programs. Other specialists prepare themselves for the career by studying social work. The Council on Social Work Edu­cation requires that five areas be covered in accredited bachelor’s degree social work programs: human behavior and the social environment, social welfare policy and ser­vices, social work practice, research, and field practicum. Most programs require two years of liberal arts study, followed by two years of study in the social work major. Also, students must complete a field practicum of at least 400 hours. Though some starting positions require only a bachelor’s degree, most supervisory and administrative positions within social work require further education. Graduate programs are organized according to fields of practice (e.g., mental health care), problem areas (e.g., substance abuse), population groups (e.g., the elderly), and practice roles (e.g., practice with individuals, fami­lies, or communities). They are usually two-year pro­grams with at least 900 hours of field practice. Doctoral degrees are also available for those interested in research, planning, or community outreach jobs. For years, people with disabilities have faced discrimina­tion. This discrimination is fueled by fear, by misunderstanding, and by the way people with disabilities are represented in popular culture. Orientation and mobility specialists must be able to honestly address their own perceptions of people with disabilities. Specialists must be sensitive to the client’s situation and have a genuine interest in involving that person in the community and workplace. 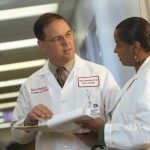 Specialists also work frequently with the elderly, which requires understanding the aging experience. Workers must be patient and be good listeners to provide the elderly with the supportive network they need. Communication skills are also very important. Much of the work as an orientation and mobility spe­cialist involves talking and listening to clients, teaching, interviewing, and counseling. You will need to provide clear instructions to clients, their families, and their employers. Because many of the problems facing those with disabilities stem from discrimination, many specialists work to educate the public about living with disabilities through research, reports, and fund-raising. Being com­fortable talking to a variety of people and in a variety of settings is an asset for these specialists. To learn more about this work, you can explore Web sites concerning disabilities and social work. A job in the school or public library helping people conduct research will put your information retrieval skills to good use. Working on the school newspaper will also help you develop your writing, researching, and interviewing skills, all important aspects of social work. Part-time data entry jobs at a hospital or long-term care facility can familiarize you with medical terminol­ogy and the services available to people with disabilities. A part-time job in a retail pharmacy will involve you directly with people with disabilities and also the services that pay for the rental and purchase of wheelchairs, walk­ers, and canes. You can also gain experience by volunteer­ing at any social service agency to get a sense of the work environment and responsibilities. Orientation and mobility specialists can find work with for-profit, nonprofit, and public programs. They may work in hospitals and community agencies such as transitional living services or with private agencies that focus on providing services specifically to those with disabilities. An orientation and mobility specialist may also be self-employed, providing service on a contract basis to individuals or social service agencies. To gain experience in social work, consider working with a social service agency specializing in information and referral. Rehabilitation centers, senior homes, schools, and summer camps for the blind, visually impaired, and disabled also offer many opportunities for experience. Because of limited funding, staffing may consist of only a few social work professionals, and the rest may be vol­unteers or assistants. Volunteer work may lead to full-time employment or simply introduce you to other social work professionals who can provide career guidance and letters of reference. Orientation and mobility specialists may advance to become supervisors of assistants or executive directors of rehabilitation agencies. Another possible route for advancement is through teaching. The more challenging and better-paying jobs tend to go to those with more years of practical experience and higher degrees. Further study, extensive experience, and good references will lead to advancement in the profes­sion. Also, many social work programs offer continu­ing education workshops, courses, and seminars. These refresher courses help practicing specialists refine their skills and learn about new areas of practice, methods, and problems. These courses are intended to supple­ment previous education, not substitute for a bachelor’s or master’s degree. Continuing education can lead to job promotions and salary increases. The higher the degree held by specialists, the higher their earning potential. Those with a Ph.D. can take jobs in indirect service, research, and planning. Salaries also vary among regions; in general, social workers on the East and West Coasts earn higher salaries than those in the Midwest. During the first five years of practice, salaries increase faster than in later years. Medical and public health social workers earned a median annual salary of $41,120 in 2005, according to the U.S. Department of Labor. The lowest paid 10 percent earned less than $26,130 and the highest paid 10 percent earned more than $60,880. Specialists who work in school systems are generally paid on the same scale as teachers in the system. Those who work for private clients are usually paid by the hour or per session. Orientation and mobility specialists work part of the time in an office, analyzing and updating client files, interviewing clients over the phone, and talking with other service agencies. Depending on the size of the agency, office duties such as typing letters, filing, and answering phones may be performed by an aide or vol­unteer. The rest of their time is spent outside the office, inter­acting directly with clients and others. Orientation and mobility specialists are involved directly with the people they serve and must carefully examine their clients’ living conditions and family relations. Advocacy involves work in a variety of different envi­ronments; it involves meetings with clients’ employers, agency directors, and local legislators. Should the client press charges for discrimination, orientation and mobil­ity specialists may be called upon to testify in court. Both counseling and advocacy can be stressful aspects of the work, but helping to empower people with dis­abilities can be very rewarding. According to the American Association of People with Disabilities, more than 56 million people (nearly one out of every five Americans) have a disability. In addi­tion to continuing the fight against discrimination in the workplace and in general society, the disabled also need assistance in order to live productive lives. Future funding is an important consideration for social service agencies. In many cases, the agencies providing information and referral must compete for funding with the very programs to which they refer people. This calls for good relationships between agencies and services. In order for agencies to receive adequate funding, social workers, including orientation and mobility specialists, must con­duct research and provide reports to federal, state, and local governments showing proof of financial need. Their reports help to illustrate where funds should be allocated to best serve the disabled community. According to the U.S. Department of Labor, the employment of social workers, including those that work with the visually and physically impaired, is expected to increase faster than the average for all occupations through 2014. Specialists will continue to increase public awareness of the importance of aid for the disabled and visually impaired. Assistance services will continue to make their way into more public areas, such as libraries, workplaces, and other public facilities. New computer technology will continue to cater to the special needs of the disabled. The development of specialized equipment and the expansion of Internet resources allow the disabled and visually impaired to access online resources for assistance. Orientation and mobility specialists will be needed to help those with dis­abilities use new technology to their best advantage.